Announcement comes after first nominee withdrew. President Donald Trump has nominated Alexander Acosta as his labor secretary. "He has had a tremendous career," Trump said of Acosta. "He's a member and has been a member of the National Labor Relations Board and has been through Senate confirmation three times." Acosta is the first Hispanic to be selected for Trump's Cabinet. The announcement comes after Trump’s first nominee for secretary of labor, Andrew Puzder, formally withdrew from consideration for the position Wednesday — a rare move for a Cabinet-level pick. Puzder came under scrutiny after admitting earlier this month that he had employed an undocumented worker for years. In 1990 his ex-wife claimed that he had abused her; she has since withdrawn the allegations. He has denied wrongdoing. 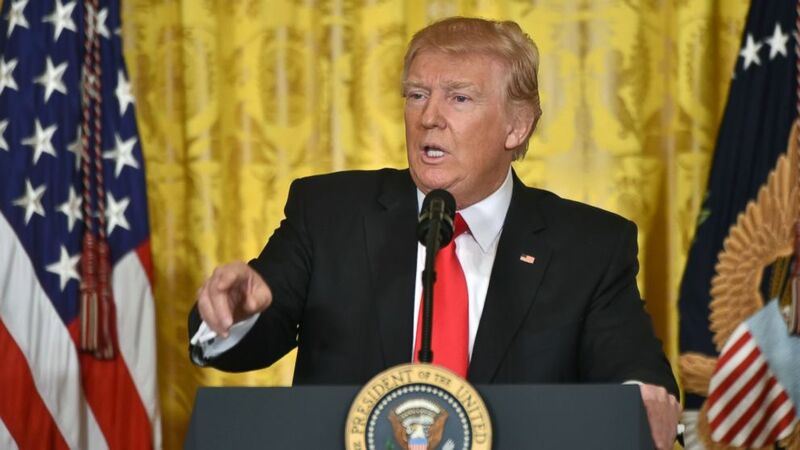 (Nicholas Kamm/AFP/Getty Images) President Donald Trump speaks during a press conference, Feb.16, 2017, at the White House in Washington. His withdrawal is the first unsuccessful nomination of the Trump administration. Nine of his 22 Cabinet-level picks have yet to be confirmed. Senate Minority Leader Chuck Schumer called on Puzder, who heads CKE Restaurants, which owns Hardee's and Carl's Jr., to withdraw for more than a week. Several GOP senators hinted that they had reservations about his nomination. Acosta is the chairman of U.S. Century Bank, which is the largest domestically owned Hispanic community bank in Florida, and is the dean of Florida International University Law School. He has served as the U.S. attorney for the Southern District of Florida and was an assistant attorney general for the civil rights division at the Department of Justice under President George W. Bush. He was the first Hispanic to hold the rank of assistant attorney general. The president of the Hispanic National Bar Association, Pedro J. Torres-Diaz, released a statement congratulating Acosta for his nomination, saying that Acosta "understands that our nation's diversity is our strength." "Today's nomination demonstrates that diversity does not come at the expense of highly skilled and experienced candidates for this presidential Cabinet," Torres-Diaz said in a statement. "The nomination of the son of Cuban immigrants, with a demonstrated commitment to public service and our nation, is just one example of qualified and diverse individuals around the nation that will not only help lead the government but also better reflect the citizens it serves. We commend and urge this administration to continue to recruit from the pool of diverse talent as it fills the remaining posts."